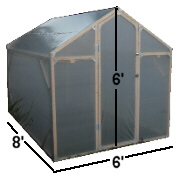 Thank you for your interest in the ultimate mini greenhouse being sold in Northwest Florida! 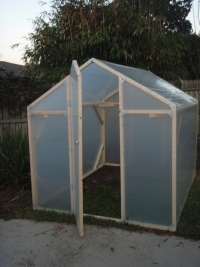 We at minigreenhouse.org have worked with our master gardener to design and build an ultra portable and affordable mini greenhouse. Now you too can own your very own mini greenhouse where you can propagate seeds and grow vegatables, flowers, herbs, or whatever your mind can imagine. The possibilities are endless! Own your own mini greenhouse! The dimensions are 6' wide, 8' long, and 6' tall at the very center (where the peak is). This is a view from the inside of the mini greenhouse. 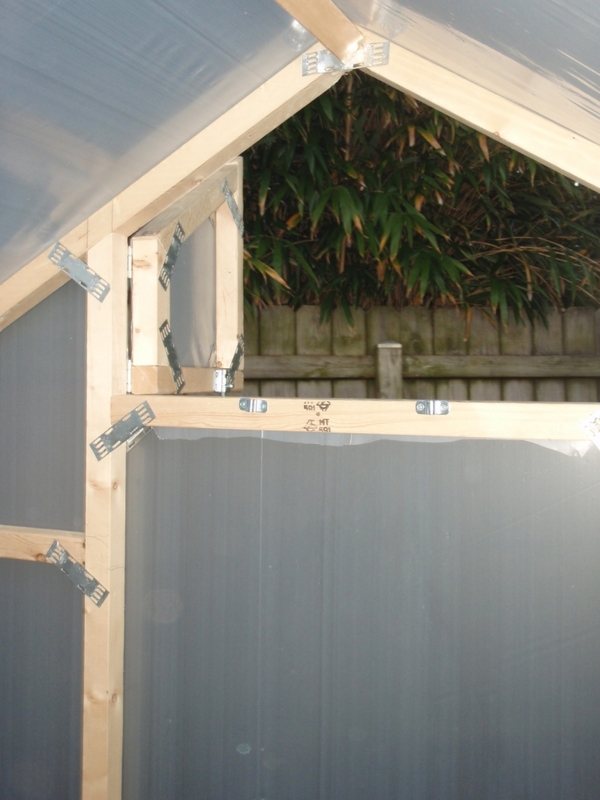 Note the mini french doors for ventilation and the vertical supports to add strength and rigidness to the structure. Also note the angular braces for reinforcement! A view of the mini french doors open. These doors are latched and are used to ventilate your greenhouse as temperatures can reach well into the hundreds inside your greenhouse. Here is a classic view of the front of the greenhouse with the door open. Take note of its stylish exterior. 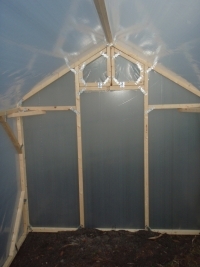 Here is a sample of how one minigreenhouse owner configured their minigreenhouse. Please note the that potting bench, shelves, and plants are not included in the price of the minigreenhouse. View towards the back with customer installed shelves and potting bench. Take note of all the extra space on each side of the potting bench that could be for more plants or shelves. Display of variety of pots showing the versitility of the minigreehouse. Take note of how much vertical room these plants have to grow. A view of the shelves and peaking out the front door. These are homemade pots that this minigreenhouse owner made from newspaper in which to start their plants. When its time to plant these plants in the ground, they will just plant newspaper and all. This is a shot of the stylish thermometer and hygrometer that is included with every minigreenhouse. 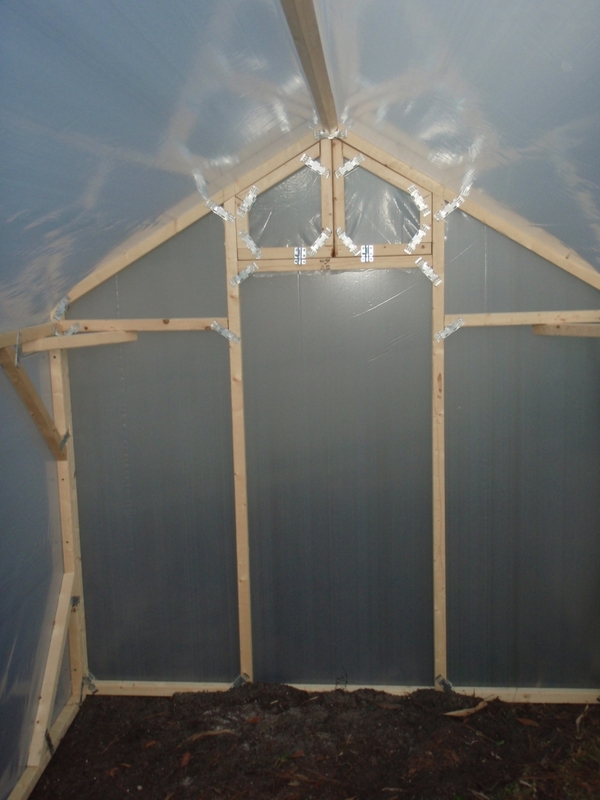 It even stores the maximum and minimum temperature and humidity for the greenhouse until one decides to reset it. More newspaper pots, and sprouting healthy tomato plants. Notice how uniformly green and unburned the tomato leaves are. This is due to the uniform light distribution and ideal conditions that the interior of the greenhouse provides. This is a shot from the front of the greenhouse towards the back and to the left showing this minigreenhouse owner's shelf configuration. Look at all the divided cell containers for starting seeds. Imagine how many plants you could have if you maximized your shelving and covered them with those! This is a shot from the front of the mini greenhouse showing this minigreenhouse owner's shelving configuration towards the back and to the right. Look how much room there is in the center isle to walk around and do things! Call me, Neel K. Sanghi at 228-234-6335 to order your greenhouse or with any questions you have. You may also email me neel@minigreenhouse.org. I am prepared to accept cash, credit card, or paypal for your custom greenhouse. I live in Milton, Florida (near Pensacola).